It’s been a fantastic time for a number of the free tipsters we track and monitor here at the Smart Betting Club and today I wanted to highlight a couple of experts on fire at the moment. 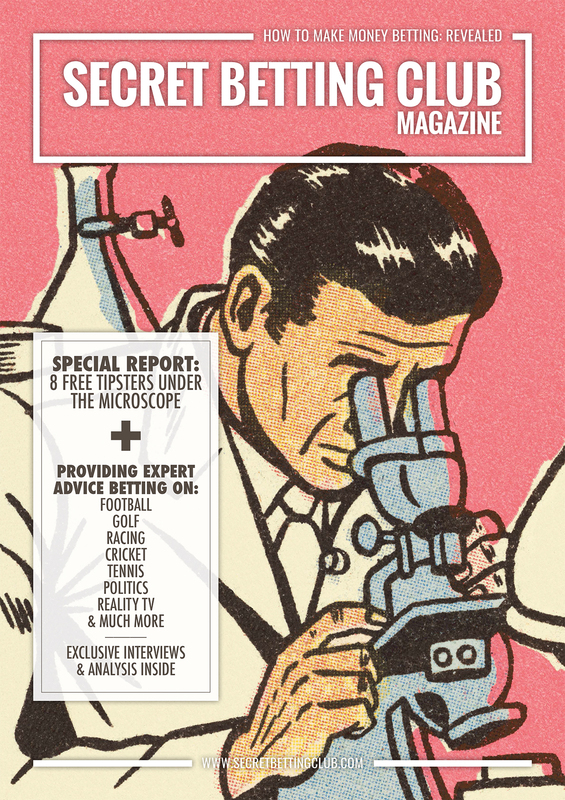 We recently put together an extra special ‘Free Tipster Report’ featuring interviews with 8 betting experts we had identified with profitable track-records. One of these was the Golf & Rugby expert, Simon Mail who just last week picked up a massive 200/1 winner courtesy of Billy Hurley who won in last week’s Quicken Loans National golf tournament. Simon puts up all of his advice on either his Twitter account or via his Betting.Betfair articles. This success is not a one-off either as he also highlighted recent winners at 45/1 (twice) & 40/1 in other tournaments. If wanting to find out more – we have a full interview with Simon and 7 other free tipping experts for you to read in this special report available now to all SBC members. If you think a 200/1 winner is impressive, you will want to check out the 278/1 Betfair SP winner that SBC Forum Tipster ‘Sporting Interest’ put up just last week as well. The horse in question was Quandary Peak and to back up this success, Sporting Interest also picked up two further winners at good prices (Commissioned (22.57) & Merhoob (7.52) on the very same day. All told, since the 1st August 2015, they have made racked up 166 points profit from over 1000 bets and all at a ROI of 12.2%. They tip on a variety of sports – namely Racing, Football & Golf and have agreed to continue sharing all of their bets for free on the SBC Forum for members to enjoy until the 31st July 2016. You can also read a full review and analysis on Sporting Interest in the latest SBC magazine – Issue 97. If you are interested in sourcing good quality free tipsters then the Smart Betting Club can help you. Interviews with 7 other tipsters in our special ‘Free Tipster Report’ released earlier this June 2016. Profitable across a variety of sports and betting markets – you are sure to find someone to interest you. The free horse racing tipster with a fantastic record (11.1% ROI from 646 bets since 2013) as reviewed by us in SBC 97. Providing easy profits for just a few minutes work each day and from a proven expert source. Chasemaster Racing Tips: This proven racing tipster has made a significant profit since 2008 and they have agreed to share all bets for free with SBC members until November 2016! Since 2008 they have made a 12.2% ROI from 2779 bets from their expert ‘chase racing’ tips. They are also in great form with 89 points profit at 44.72% ROI from their last 6 months of tips (Correct as of June 2016). As an SBC member you can pick up ALL of Chasemasters tips FREE via email or through access to the SBC members only forum. Paceman’s ‘Short But Sweet’ Favourites: Another very popular racing tipster available to all SBC members is Paceman and his ‘Short but Sweet’ favourite tips. During his first year of tipping between May 2015 and May 2016, he generated a profit of 40.58 points at a ROI of 15.97% from 254 bets with a strike-rate of 45%. Who says you can’t make a profit backing favourites!!? Roosters Racing Tips: New to SBC members from June 2016 is the top racing tipster – Rooster Tips who joins us having made 37% ROI from 729 bets since January 2014. Sign-up as a Smart Betting Club member today and gain instant access to our Forum and Expert Reports. Yesterday saw the release of Part 2 of our 2016 Best Tipster Guide featuring the final section on 6 of the very best tipsters we have uncovered over the past decade. So today to help showcase how these tipsters can help you, I want to delve a little deeper into one of the featured tipsters reviewed inside it and some of the findings we uncovered. As I will go onto reveal – there is so much more to reviewing a tipster rather than simply just examining whether they are any good or not. First of all, let me set the scene as regards one of the tipsters we focus on in Part 2 of the Best Tipster Guide that I want to discuss today. It’s a well loved football service – which provides tips from 3 slightly different (yet ultimately profitable) betting systems. As a subscriber to the service you receive the tips as generated by each of the systems throughout the English football season. When examining any tipster its vitally important to observe exactly where they make a profit so as a punter you can understand where their edge lies. One simple pattern we observed when examining this football tipster (as with most others it must be said) is the fact that their away bets are generally more profitable than home bets. AND if breaking home and away bets down to certain odds ranges – some clear profit patterns emerge as the following tables prove. This first table concentrates on the performance of home tips both under and over 2.0 (evens). Although those under evens are profitable, the gains are fairly marginal. Examining the away bets put forward by the tipster we also identified a trend whereby the better performance came from those priced at 2.75 (7/4) and above, which was responsible for the greatest return as the table below indicates. This kind of analysis can help when following any tipster, whether it be the type of bets you want to concentrate on or stake more on – Or simply to help you understand where the tipsters edge actually lies. I have spoken about compound staking on a number of occasions in the past (as here with this racing tipster) because when done right it can make a major difference to the profits you make. Take one of the 3 systems provided by this football tipster – which has produced a 157.9 point profit at 5.8% ROI from 2739 bets over the course of the past 6 seasons. This is an ideal service to consider for compound staking as it hits a high strike-rate (44.1%) and has generally performed very consistently over time. So rather than simply staking the same amount on each and every bet over the course of any given season, a compound staking method (whereby your stake adjusts with the size of your betting bank) can work very well in this instance. To prove the point – here is what would have happened if you had followed the service just using a £1000 betting bank all the way through (Effectively the amount you staked on each bet would have remained the same). This approach would have made you a profit of £3,158 (315.8% Return on Capital) over the lifetime of the service. Good figures of course but they can be improved on. For those of you looking to be a bit more creative, this next table illustrates what happens if you adjust the stakes after every 100 bets based on how much profit you have made. If following this method, your profit grows to £6,098 (609.8% Return on Capital) over the exact same number of bets. And for those of you looking to be a bit more creative, we also have a couple of other suggestions – including what happens if you simply adjust your stake after each bet. Here your profit grows to as much as £8,821 (882.1% Return on Capital). And finally the biggest profit actually came from adjusting your stakes at each point where your bank has grown by 25%. This method will have made a £15,690 profit (1569% Return on Capital)since inception. The keen-eyed amongst you will have noticed the ‘Max Drawdown’ figure for each of the tables above and this is a very important figure to consider before going overboard on Compound Staking. This figure effectively tells you what the biggest drop will have been using each staking method during a bad losing run. So for example the Compound 25% method will have seen you finish up with £15,690 profit, but at one point you will have lost up to £8,207 during a bad run of form. That loss would have been in context and made up purely of the profit you had made but it does show how an aggressive staking plan works both ways. I only have room to discuss these two findings as outlined in the Best Tipster Guide, yet there is lots more I could have shared. For example – which is the best system of the 3 ideal for those of you keen to just choose 1? What is the best and worst time to place your bets when following this tipster and why it can pay to wait until seconds before kick-off to achieve the best profits? If interested in finding out more, you can do so with access to the full 2016 Best Tipster Guide as with Parts 1 and 2 now available, it includes detailed reviews on 6 top tipsters we have uncovered over the years. Plus, to celebrate the 10 year anniversary of the Smart Betting Club in 2016, you can also save £16 on the cost of the Platinum ‘Pro Punter’ membership package. Sign-up now and gain instant access to the Best Tipster Guide. Ever since the likes of Pinnacle Sports and SBObet withdrew from the UK in November 2014 (thanks to the introduction of new UK legislation), I have been on the lookout for licenced firms able to offer competitive odds on sports such as Football, US Sports, Tennis & Golf that would be of interest to UK & European punters. Step forward then Eastbridge, who have recently acquired a UK Gambling Commission licence and are now offering a unique, bespoke betting service for punters who like to bet on sports such as Football, Tennis & US Sports. Best of all – they are offering extremely competitive odds as their model is based on a high-volume, low-margin approach, similar to that of the likes of Pinnacle Sports. With an easy to use Skype betting service as well as WhatsApp or Telephone betting options, Eastbridge looks an ideal solution ahead for price sensitive punters – especially those based in the UK and Europe. After news broke on the recent acquisition of their UK bookmaking licence, the SBC team have begun to observe and examine the Eastbridge service to fully understand how it works. Whilst we continue to observe their service ahead of a full SBC review, we recognised that with so many betting markets of note this summer (Euro 2016, Copa America & Wimbledon to name just a few) it would be of benefit to release our initial thoughts. Therefore, to get the ball rolling, I interviewed a member of the Eastbridge team to find out more on what is on offer and how you can benefit from their service. He helps to explain exactly what kind of punters his service will appeal to plus the sports you can bet on with Eastbridge…. When doing so, make sure you select Smart Betting Club in the ‘How You Heard About Us’ dropdown menu so they can assist you fully. SBC: Can you introduce Eastbridge and the services you offer? EB: Eastbridge is a bespoke sports betting solution for all, we can offer a range of services including Skype based betting brokerage, traditional bookmaking with a very client friendly twist, an online brokerage platform and an API solution for automated trading groups. Also, after partnering with an established and trusted UK bookmaker, we are now licensed & regulated by the UK Gambling Commission. The Eastbridge brand was established here in the UK in 2014, to focus on the UK and Europe. Our office is based in London Bridge, where we are like to meet with our clients whenever possible. We are well known within professional betting and football syndicate betting circles in the UK, Europe and Asia, where we have a reputation for discreet and trustworthy client management, not to mention reliable products & services. We aim to bring these principals and benefits to a wider audience of serious part time traders and recreational punters in the UK and Europe, who could all benefit from our products & services. SBC: What kind of punters will benefit from using your service? Is it those looking for a genuine alternative to the likes of Pinnacle Sports? As great as it is to be licensed here in the UK, unfortunately the laws are still quite restrictive and as such we are only offering UK clients access to our traditional bookmaking service. The other services are not covered in the UK by our license, but we can provide them to non UK residents. However, the customer friendly twist on traditional bookmaking is that we are running our book with very low margins and professional risk management, especially on Football, Tennis and US Sports. This enables us to service professional traders, syndicate groups, serious part time clients, as well as recreational punters, with much more freedom than typical European bookmakers, who limit client accounts even after just a few bets. SBC: Do you ever restrict or close customer accounts? What is your attitude towards winning gamblers? For our key sports of Football (Asian Handicap), Tennis and US Sports, we do not restrict our client’s bets. For other sports, there will be some limits in place as they are not our main area of expertise. Naturally, this kind of service is more suited to higher staking clients, who are looking for competitive prices and/or have experienced account restrictions or high commission percentages elsewhere in the past. But, we are happy to lay bets for everyone. SBC: What sports do you take bets on and what size bets are you able to take? The primary sport we offer is Football and particularly the Asian Handicap and Asian Total Goals markets, where we can take bets to very large six figure size stakes. But, we are also able to take very large bets on Tennis, NBA, NFL, MLB & NHL. We can also take bets on Cricket, Golf, and most other major sports, but we do not take bets on horse racing. These other sports are managed with much tighter & lower limits, plus the maximum takeout on these minor sports is around £2,500 and our minimum bet size is £25, for all sports. SBC: How exactly are customers able to place bets with your service? All our clients use Skype to place their bets, but we can also offer WhatsApp and Telebetting (primarily for in-play bets), if a client would prefer to use them instead. Using Skype to place bets is fast and easy, plus it avoids any issues of gambling websites being blocked on a client’s work computer. The service runs from 9am to 9.30pm, but sometimes later to cover evening kick offs. Our team then checks the price (or better) and stake is available, before returning to the client to confirm they want to place the bet. Once the client confirms, the bet is officially placed. SBC: How can customers keep track of their betting performance with you? Can you provide account statements? Statements can be requested via Skype whenever a client wants, plus deposit and withdrawal via credit/debit card, Skrill or bank transfer are also managed via Skype. SBC: What is the account opening process like? Account opening is also quick and simple, after clients provide a few basic details such as name and contact information, as well as some insight into their betting habits & preferences, we create an account in our system and connect them to our Bet Placement Skype. Then they are ready to bet as soon as they fund their account. Plus, their account manager is always on hand for any issues or questions that arise in the future. SBC: Are there any fees to be aware of if using your service? As we are currently only able to offer a traditional bookmaking service under our UK license, there are no fees, charges or commission for UK clients to pay when betting with Eastbridge. SBC: How secure are the funds deposited with you? What assurances can you give that the money placed with you is safe? Being licensed by the UK Gambling Commission gives our clients the confidence that, our services and their accounts are professionally managed & most importantly their funds are 100% safe in our UK bank account. SBC: Finally, can you sum up why SBC readers should consider opening an account with you? If your readers are keen to bet on Football, Tennis and US Sports in particular, at very competitive prices, without the usual threat of having their account shut down and with a high level of professional service as standard, then they really should come and give Eastbridge a try. SBC: How can someone find out more and open an account? For further information and to open an account, visit www.Eastbridge-sb.com and complete the membership enquiry form. Please make sure you select Smart Betting Club in the ‘How You Heard About Us’ dropdown menu so we can assist you fully. Hopefully the above answers have given a good overview of what it is Eastbridge offers and why they might appeal to those of you based outside the UK. Here at SBC we have recently began to use the Eastbridge betting service ourselves, so do plan to return with a full review and analysis of what is on offer once we gauge more experience. Although our collective experience thus far has been good, I do have to recommend caution when opening an account with any new bookmaker. Taking sensible precautions such as not holding huge sums in your account are very important and I highly recommend this, not just for Eastbridge but with all bookmakers in general. I plan to return with more on Eastbridge ahead of the 2016/17 Football season including a full SBC review. Looking For Good Free Tips? Try These 8 Free Tipsters For Size! As part of an extra special investigation into free tipsters, today we have released a unique report focusing on 8 profitable betting tipsters who currently share their tips online for free. This one-off report features our interviews with each of the 8 tipsters, who they are, what they do, how you can follow them and just how much profit they have made over the years. • The 1-lay-a-day football expert with a profitable record dating back to 2012. • The Irish racing guru up 25% ROI last flat season and with a very profitable Ante-Post portfolio to boot. • The rugby expert up to the tune of 31.98 points so far in 2016. Plus 5 other free tipsters with profitable records betting on Football, Golf, Racing, Cricket, Tennis, Politics, Reality TV & many more markets. This special report has been put together as part of our ongoing quest to find the very best betting tipsters – both those that charge and those that offer their advice for free. Perhaps best of all – each of the 8 expert tipsters featured within this report are as yet not widely known by the vast majority of punters so it’s a great opportunity to get in ahead of the crowd and start to benefit from their advice. They are part of a new breed of professional, practical and most of all profitable tipsters that punters are following these days. So if you are interested in finding out more about these 8 free tipsters, make sure you check out this special report available now to all SBC members. Sign-up now for instant Smart Betting Club access. This particular football tipster has a very impressive record with a 12.2% ROI from over 2000 bets from the first 22 months of their service – up to Mid-April 2016, which was the cut-off point for our initial review. The even better news is that since then, this service has thrived – adding a further 20.79 points profit at 14.58% ROI from their most recent 152 bets. This includes advice so far during the Copa America and Euro 2016 tournaments, where they are also sitting on a host of good looking ante-post bets. And this added to the fact they are offering ALL Smart Betting Club members 35% off the cost of the service before the 1st August 2016 – makes it an ideal service to consider joining. If subscribing to their service for 6 months or more, the discounts on offer can save you more than the cost of joining the Smart Betting Club itself – making it a total no-brainer if interested in how they can help you. Full details on this service, including our in-depth 8 page review scrutinising everything from type of bet performance, staking, betting banks, odds availability and practicality can be found in SBC 97. • The Free Racing Tipster up 11.1% ROI & 140 points profit since 2013. Extremely easy to follow and from a proven winning expert. • The Racing Tipster duo with an excellent track record: 13.8% ROI from 2306 bets and over 200% bank growth since 2014. This pair know how to make money on racing. • The Free Golf, Racing & Football Tipster in profit to the tune of 15.4% ROI & exclusively available via the SBC Forum. 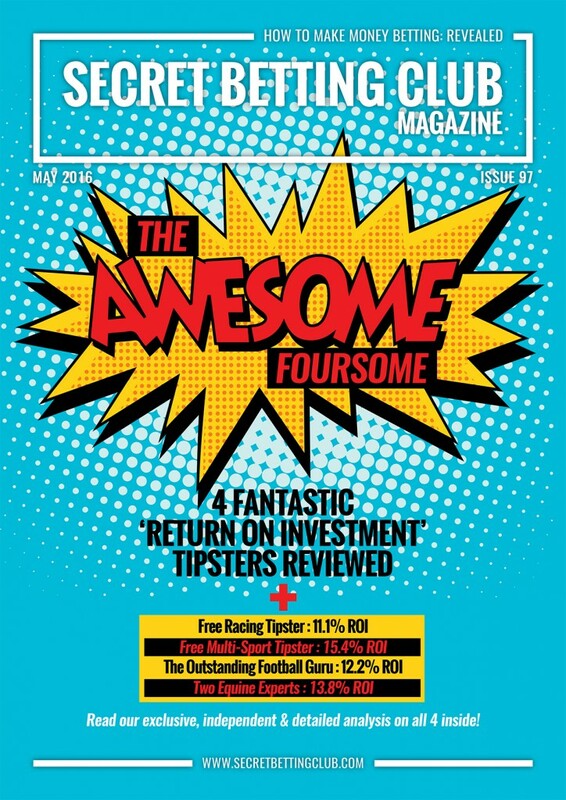 Of the Awesome Foursome – two of the tipsters are totally free to follow, whereas the other two are offering exclusive discounts to SBC members only including a 35% discount on the cost of the football guru mentioned above. All as part of the major tipster savings we negotiate on your behalf! To celebrate our 10 year anniversary in 2016, we are deducting £16 off the cost of ALL Smart Betting Club Memberships – Silver, Gold and Platinum, making it an ideal time to see just how we can help you make money betting. So if you have yet to try our service out, make sure you do now and save £16 via this special offer. Today for a bit of a walk down memory lane, I have rounded up our 9 most popular blog articles and emails from the last 12 months. Whether it’s unveiling the 3 worst bookmakers (as rated by you), my biggest winner of the year or revealing some of the lies in the tipping world, there is plenty to re-visit especially if you missed them first time around! Perhaps no surprise to see this article lead the way – as we reveal the worst bookmakers as voted by you from 2015. Recommended reading – unless of course you work for Boylesports or Stan James! This simple strategy turned £10 into £778.20 (view my betslip) and it’s a very simple idea that can help maximise your profits if following good tipsters. SBC writer, Rowan explains how he made 64.4% Return On Capital (AKA Betting Bank Growth) in 2015 by following his select group of tipsters. That’s 10k into 16.4k – not bad work if you can get it (and all tax free in the UK). Penned in January for those looking to turn New Year Resolutions about betting success into reality – the advice in this 5 point profitable plan ring true at any time of year. How you can increase your profits by using some simple ‘Compound Staking’ methods – in this article we explain the 4 different ways to profit from just 1 tipster. We all hate losing runs but at times there is no escaping them – therefore learning how to handle them and how to ride them out is key to betting success. This article explains a few of our tips on coping during a bad period. It’s not just politicians who play fast and loose with numbers but some tipsters do. Learn how to see through the BS and examine the tipster statistics that really matter! Can’t make money betting at short odds? Think again as in this article we explore the tipster doing exactly that and the benefits of betting odds-on. A few tricks of the trade from the SBC team on exactly how we review any tipster. Learn how to spot the good, bad and ugly from a mile away. You can read even more articles from the team here at SBC on our betting blog. Don’t forget either you can save £16 on the cost of a Silver, Gold or Platinum SBC membership to celebrate our 10 year anniversary. Sign-up now and gain instant access to the world of profitable betting! £16 Off ALL SBC Memberships – OFFER EXTENDED! If you are interested in signing-up for a Smart Betting Club membership I have good news as our special £16 discount is being extended for the next few months. This is to celebrate our 10 year anniversary in 2016 and offer you the chance to sample our service and see how we can help you make money betting. So whether you want to join SBC as either a Silver, Gold or Platinum member you can save £16 on the cost of subscription. Sign-up now and get started right away! Real-Life Story: £20k In Profit In 2015…. Over the course of the past 10 years we have helped many people with their betting, such as ‘Pendo’ who has been a Smart Betting Club member since 2012. After following our advice not just on the best tipsters but setting up his betting banks properly, he is now cashing in – making a 20k profit in 2015 alone. “The Smart Betting Club has completely changed my whole outlook on the way I bet. I follow four really genuine hard working tipsters all of whom have been recommended by SBC and can confirm that everything that they print is 100 percent true. They never hide anything. You can never predict how a tipster is going to do in the next 12 months, but SBC’s reports help point out those they feel offer the best chance of success. What I can say is that I personally won 20 grand last year in 2015. This year (2016) hasn’t been as good yet as I’m down about £1000 but its very early days. Overall I am hugely in profit and thats vitally important. Another very important thing I can advise is to keep a record of all your bets and have a betting bank of a good size (follow the SBC recommendations!). Its easy to be a good winner, anyone can do that but it’s when thing go wrong that you have to trust the guy or guys that you use and I trust SBC and the tipsters they recommend. It has taken me a few years to actually learn how to manage my betting bank as I never used to have a spreadsheet to keep a record of my bets .So when I was on a bad run which happens a lot I thought I was losing in the long run when I wasn’t! I was actually in profit but the most recent losses skewed my feelings from reality! Pendo’s story is similar to many other Smart Betting Club members I have had the pleasure of speaking to over the years who continue to make money betting. After all, over 85% of those surveyed in our end of year members poll told us they made a profit in 2015 – far greater than the usual 1% or so who make a profit betting usually. So why not take the plunge, save yourself £16 and enter the world of professional betting.